Grown out of the boom in social media, many Facebook groups have now become car clubs in their own right. What started as small, common interest groups, they have rapidly grown into communities. The Westfalia Refuge started in May 2016 and with around 2,200 members this Facebook group is a flourishing community. Being part of this group is so much more than just a place to chat about your T3. The group opens up opportunities to mingle, buy, sell, share wisdom, make friends, post pictures…even rant… and anything else as long as it’s T3 Westfalia related. The T3 Westfalia Refuge is a Facebook group created specifically to cater for the interests of owners and enthusiasts of the T3 Westfalia range of campers. Whilst there are many VW T3/T25 groups on Facebook there wasn’t a group specific to the Westfalia models. Just about anything goes as long as it’s T3 Westfalia specific. We have a fantastic, flourishing community, it’s become a huge knowledge resource, it’s great assisting in finding specific parts and Westfalia vans are often advertised for sale too. Is there a team who run the group? We have a team of 3 admins, all own T3 Westfalia’s and between us we manage the day to day stuff in the group. For those that might not know, tell us a bit about what vehicles are covered by the group? Do you have to own a Camper to join in? No! It’s not just for existing Westfalia owners, it’s for enthusiasts too. Several people have joined up as non-owners looking for advice and have since gone on to purchase their first T3 Westfalia. We have a relaxed admission policy, asking a question which any enthusiast should know before they are accepted to the group. We have a broad spectrum of owners and members scattered across the globe, the U.K., mainland Europe, the U.S.A., Canada, Australia, and beyond! Do members receive any discounts for being part of the group? Yes! About 12 months ago I began speaking with ClassicLine Insurance about organising a group discount scheme. It’s proved to be a great success, feedback from many of the members has been great. ClassicLine have not only saved them money on their renewals, members have been extremely impressed with the customer service and helpfulness of the team at ClassicLine. CL: Thank you! We love working with with everyone at Westfalia Refuge! Don’t forget members of Westfalia Refuge get 15% off their Camper insurance with ClassicLine. A further benefit we organise is regular group buy deals from Brickwerks. Brickwerks are regarded as the very best retailer of parts for these old vans. They provide us with outstanding service and carry more parts for next day delivery than any other company by a country mile. So, Ian, how about you? I’ve been involved since day one in the group. My Westfalia Atlantic and my Syncro are my favourite and most often used. Personally, I have owned over a dozen T3 Westy’s over the years, no other camper van is more functional and better designed yet still feels retro for me! When we travelled through California (in a rented T3 Westfalia of course!) one evening we camped next to a beast of a camper, (RV as they are known in the U.S.) a $2 million motorhome called a Marathon Coach. It was huge, immense and as luxurious as any hotel I have ever stayed in. I was more than happy to sleep that night in our rented Westy. I guess the answer to the question is I already own my ‘dream camper’. 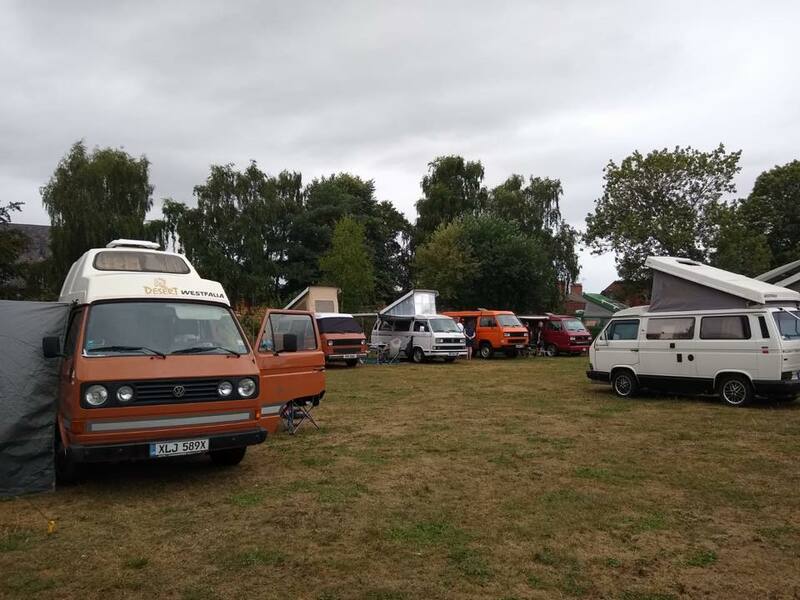 Well, last May we organised our first group event, The Annual Westfalia Refuge Revelry. This took place in May at Lyndon Top in Rutland, the turn out was great! It was a fabulous weekend catching up with old friends and meeting new ones – we even organised a trophy for best van via the people’s choice. 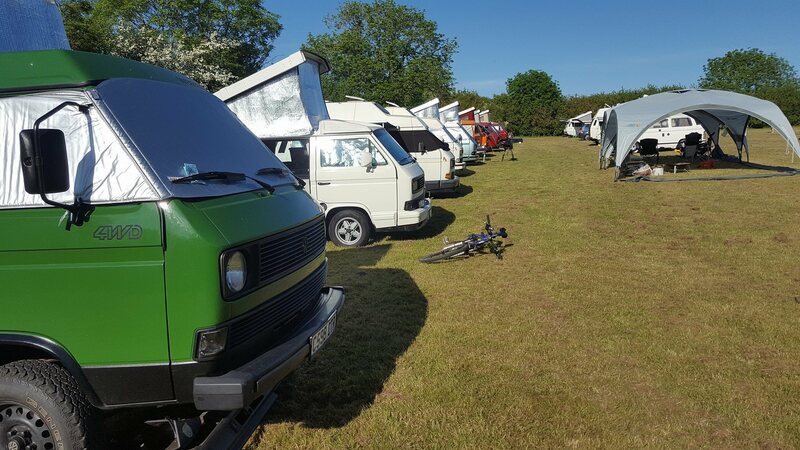 Such was the success of the event, the 2nd Annual Westfalia Refuge Revelry is already on the calendar, same venue, 17th – 20th May 2019. 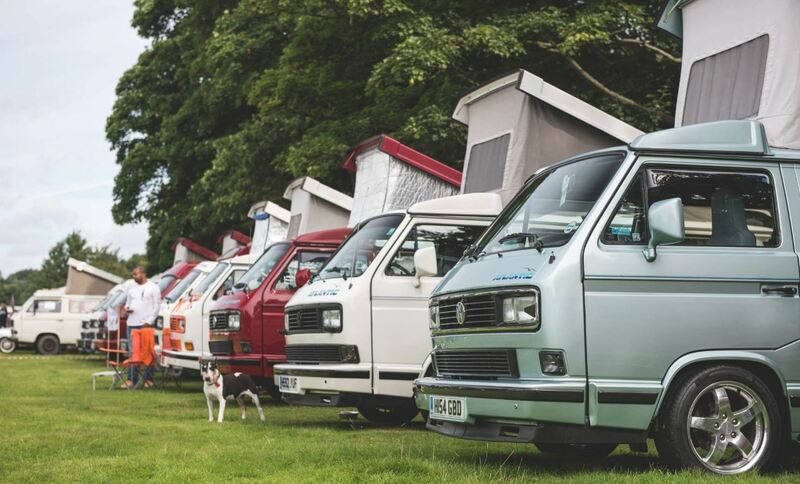 It’s a T3 Westfalia only event, numbers confirmed for this year’s gathering has already exceed last years, it’s destined to be even more fabulous! CL: Sounds good, keep us updated! Do you cruise to other events and park up together as a club as well? Yes! Plenty of us have met up at various shows that are on the VW show calendar. We love the excellent T3 Bus Meet at the Stoke Prior Sports & Country Club in Bromsgrove. The organiser of this show, Robin Fearn, is hugely passionate about these vans. He owns a T3 Westfalia, is a valued member of the Westfalia Refuge and even has his own business repairing, servicing T3’s. What are your other must do VW events throughout the year? The T3 Bus Meet and VWNW at Tatton Park as we have a meet up of Westfalia’s there too. It’s likely I’ll visit others, but these are always the first on the calendar. So, Ian, in relation to the Westfalia Refuge, what do you feel most proud of? The community spirit in the group. We all share a common interest like most groups/clubs but we have an enormously helpful bunch of people in our midst, some with second to none technical knowledge who are always eager to step forward and help the other members. It’s growing in size at a more rapid rate these days too and we are seeing more international members joining than ever. As VW retailed T3 Westfalia’s across the globe we do appeal to a wide-ranging audience. Can you any tips to someone wanting to get involved? T3 values (good, original examples) have firmed up in recent times, in mainland Europe, the U.S. and Canada the best examples of T3 Westfalia’s are often now commanding more money than Splitscreen’s and Bay Windows. To any prospective owner the best advice I can offer is buy the most original and structurally sound example your budget can stretch too and always take advice from folk who know these vans. Mechanical issues are far easier and cheaper to remedy than rust! If your budget can stretch to a Westfalia model, it’s like money in the bank, they are investments and the only way is up on values now. So, what’s next for the Westfalia Refuge? There are frequent van restorations that are featured in the group, solar installation projects, engine upgrades etc. It’s a fabulous hub for any T3 Westfalia owner. Talk has already started about an international road trip amongst some of the group, most likely this will happen in 2020, watch this space! Westfalia Refuge, thank you for being our car club of the month. We look forward to seeing you all at an event this year! Beat winter blues – join us at CamperMart 2019!